FEP tubing can be extruded in very long, continuous lengths. FEP offers superior transparency for applications that require visual inspection. 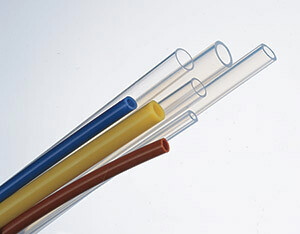 FEP tubing is very similar to PFA tubing in flexibility and appearance. The major difference is the service temperature range for FEP: -73 to 204°C (-100 to 400°F). 참고: Specifications shown are typical and are meant only as a guide. Field testing is recommended to find the actual values in the given application. FEP is clear in color and can be heat sealed and heat bonded. Sold in standard lengths of 25, 50, and 100 ft. FEP packages have no splices. Consult Sales for available non-standard colors.